‘Nayi Disha- Mujhe Padna Hai’ covers two sub programmes namely ‘Dreams Learning Centre’ (DLC) and ‘School Reforms Programme’. DLC is a non-formal education centre that targets underprivileged children who are school drop outs, or first time learners and integrates them in different schools for formal education. Under school reforms, IDF adopts government schools from standard I to VIII to enhance the quality of education, reduce the dropout rate and bring them on par with the best run schools in terms of infrastructure, academic structure and healthy environment. So far, IDF has adopted five government schools and has taken measures for their betterment. ‘Honhar Ladki’ focuses on girls’ upto standard XII who are academically bright but drop out of school due to financial reasons. IDF mentors these girls and sponsors all their education expenses. ‘Nayi Pahal’ aims at empowering adolescent girls above 15 years and women from deprived communities by providing them skill based vocational training in handicrafts, jute work, candle making etc. IDF conducts vocational workshops to develop skills, self-respect and confidence among these girls and women. ‘Meri Muskaan’ targets girls in the age group of 10-20 years and conducts sessions and workshops to educate the girls about health, hygiene, social and legal rights, family life etc. Donations: In FY13, funds to the tune of 72% (Rs0.9mn) of total income were raised through donations. Of these, Rs0.4mn was contributed by GiveIndia and the balance through individuals. Donations have ranged from 73% to 98% of total income during FY10-FY12. Corporate Sources: As a grassroots and emerging organization, IDF has not been able to build sustainable relations with corporates so far. This is evident from the funding pattern in which donations from corporates recorded a decreasing trend - from 25% (Rs0.2mn) of total income in FY11 to 4% (Rs55,100) in FY13. Foreign funding: Global Giving USA and GiveIndia (Foreign account) have been major sources of foreign funding for IDF. In FY13, IDF managed to raise funds to the tune of 21% (Rs0.2mn) of total income as compared to Rs36,106 in FY12. (Refer Fig. 1). Programme expenses: Expenses aggregated to Rs1.3mn in FY13 with 62% (Rs0.8mn) of total expenses incurred on core programme activities including salaries. Expenses incurred on programme activities recorded an increasing trend with 24% (Rs0.1mn) of total expenses in FY10 to 62% in FY13. Programme salaries accounted for 29% (Rs0.3mn) of total expenses in FY13. IDF has a dedicated staff responsible for reaching out to beneficiaries, proper implementation of programmes and documentation of work. Hence, IDF needs to incur reasonable expenses on salaries to retain the existing staff. IDF categorises itself in development space as it intends to impact the lives of less privileged. However, the activities of IDF being directed towards education and primary focus being children, it seemed inappropriate to compare IDF with the NGOs in development sector. Direct Programme expenses for NGOs working with children averaged 75% and for those in development averaged 87% in FY13. General staff salaries: Salaries paid to administrative staff declined from 58% (Rs0.2mn) of total expenses in FY10 to 6% (Rs84,000) in FY13. This can partly be attributed to programme staff getting involved in administration work as well. Overheads: In FY13, expenses on overheads accounted for 21% (Rs0.2mn) of total expenses and include expenses incurred on repairs, rents, postage and stationery etc. Of the total overhead expenses, Rs0.12mn was incurred on rent and stationery being incidental to programme activities. 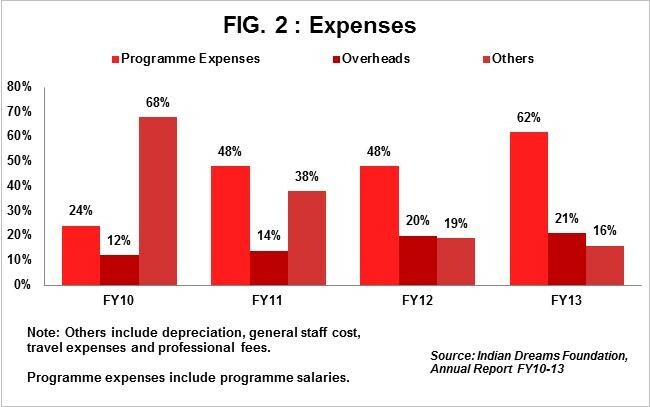 Expenses on overheads have been in the range of 12% to 20% during FY10-FY12. (Refer Fig. 2). Fixed Assets: IDF operates out of two rented premises. Hence, the fixed assets comprise of assets such as laptops, desktops, printers and furniture. In FY13 fixed assets accounted for 14% (Rs30,781) of total assets. General funds: General funds recorded a sharp increase from Rs16,000 in FY10 to Rs0.2mn in FY13 on account of Y-o-Y surplus during FY10-FY12. Current liabilities: The liabilities reduced from Rs40,000 in FY11 to Rs2,000 in FY13 as liabilities have been paid off. Income Growth Rate: IDF posted total income of Rs1.3mn in FY13 registering a growth rate of 37% as against negative growth of 6% in FY12. IDF’s income recorded a CAGR of 41% during FY10-FY13. Self-sufficiency ratio: The ratio measures ability of an organisation to meet expenses from its own funds. Own funds consist of donations. In FY13, the ratio was 72% as donations accounted for 72% of total income. Staff support: IDF enjoys support of its dedicated staff and 22 volunteers to carry on the programme activities effectively. Dependence on donations: IDF largely depends on donations (including funds from GiveIndia) as is evident from the funding pattern during FY10-FY13 (donations ranged from 72% to 98%). As a thumb rule, dependency of 20% on a single source is acceptable. More than 50% dependence increases vulnerability of the organisation. However, continuous support from donations also demonstrates the confidence IDF has earned in a short span of time. Space Constraint: IDF does not have land of its own and operates out of rented premises. This restricts IDF in designing the centre according to its needs and compels it to follow instructions from the landlord’s thereby affecting effective implementation of programmes at times. Funding challenge: Being a grassroots NGO, it’s tough to arrange funds for initiating new programs and implementing existing programs in a smooth way. The trustees on board of IDF are from diverse professional streams such as journalism & mass communication, science, social work, sociology & human rights. The Board meets four times a year. IDF has been awarded with Karamveer Chakra 2012 and Bharat Excellence award 2011 & 2012. Newspapers such as Hindustan Times and local newspapers such as Dainik Jagran, Inext and DLA (afternoon daily) have appreciated IDF’s work. Credibility Alliance has accredited IDF for transparency and accountability. IDF is also a member of GiveIndia, GuideStar, Google grants and Grants.gov. IDF conducts regular parent-teacher meetings to discuss progress reports of the beneficiaries and shares these reports with donors on a half yearly basis.